Here's a round up of our news, achievements and stats from the year. We’ve worked with over 250 brands this year including Google, McDonalds, Domino’s, YouTube, Santander, Sky, O2 and Contiki. Student Beans published our first ever book ‘The Ultimate Student Cookbook’, helping students up and down the country to eat well on a budget. Over 600,000 students visited freshersfields.com in 2013. Over 100,000 voucher books featuring offers from Jack Wills, Pot Noodle and McDonalds were distributed to students up and down the UK. Thousands of local businesses and national chains signed up to ‘Student Beans ID’, our free digital student card where students can unlock discounts via our mobile app which is coming soon! 30 Campus Brand Managers have been spreading the Student Beans word this term. There is still time to get involved in our Refreshers Wall campaign. Join the likes of Ocado, McDonald’s, Tate, GBK and Contiki and get your brand in front of 500,000+ students. Get in touch on 020 3095 1444. The most popular articles of 2013 on Student Beans were 21 Best Pics From Reasons My Kid is Crying, 22 Geniously Defaced Textbooks and 101 Reasons You Need To Live In London. Student Beans hit record breaking levels of traffic with over 3.2 million students visiting the site in one month and over 350,000 people per day on Student Beans and More Beans. Voxburner launched, delivering daily website insights on 16-24s, monthly specialist reports backed by fresh research, and a schedule of unique events. Youth 100 was trending on Twitter the morning of the Youth 100 Awards, where YouTube was named the top youth brand for the second year running. Over 40 media outlets covered the Youth 100 including Marketing Week, Gorkana, Retail Times, The Telegraph, The Drum and Marketing Magazine. Over 220 marketing professionals attended Youth Marketing Strategy 2013 and the line-up for March 2014 includes Twitter, YO! Sushi, VICE, Fallon, Facebook, Ernst & Young, Microsoft and Contiki Holidays. Get your ticket to the must-attend youth marketing event of the year Youth Marketing Strategy 2014. Voxburner’s Buying Digital Content report caught the attention of some of the world’s biggest news rooms including the New York Times, NBC News and The Guardian. freshersfields.com, the National Online Freshers Fair won the Performance Marketing Award for Publisher Innovation and was nominated for the Marketing Week Engage Award for Brand Innovator. We were named Digital Business of the Year at the National Business Awards. Refreshers Wall 2013 was nominated for the Ecommerce Award for Best Affiliate Site. Our founder James Eder was named Social Media Entrepreneur of the Year at the Great British Entrepreneur Awards 2013 and awarded the Bronze Young Entrepreneur of the Year Award. Merlin Entertainment awarded us a marketing excellence award for our work with Thorpe Park. Three bean babies were born in 2013 - we welcomed Mia, Aubrey and Noah into the world! James spoke at One Young World in South Africa and was introduced on stage by Arianna Huffington. We moved to our shiny new offices in Kentish Town, complete with meeting rooms themed Space, The Library and The Fairground. We kicked off our international ambitions by heading to New York as part of the UKTI Digital Mission. Watch this space! 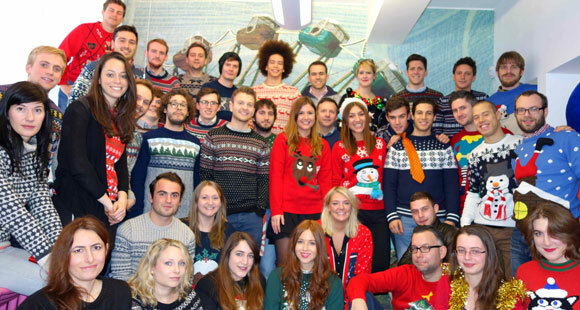 43 of the craziest Christmas jumpers were on display as we celebrated National Christmas Jumper Day. A bake-off, a rounders match and a games night helped us raise money for MIND this year. We’ve recruited 26 new people into the business, doubling in size, including bringing on board our new Head of Marketing and managers to lead operations and HR. Our newbies joined us from such places as the BBC, Deloitte and Time Out. … and we’re still recruiting! Looking for a new challenge or know someone who is? We’ve got a number of opportunities to join our growing team. Roles include Event Sales Manager, Marketing Executive - SEO and Social, Front End Developer and more. See our Jobs page for a list of all the roles we are recruiting for. That’s it from us in 2013! We look forward to sharing more great things in 2014 and feel free to get in touch if there’s anything we can help with on 020 3095 1400 or email hello@thebeansgroup.com.